Lyabi-Hauz, Architectural ensemle Lyabi-Hauz, Madrasah Nadir Divan-Begi, Sights of Uzbekistan, Sights of Bukhara. 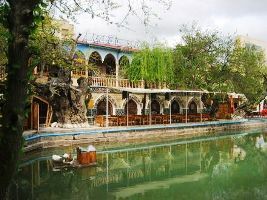 Architectural ensemble Laybi-Hauz means «the shore of reservoir» is the largest artificial reservoir of medieval Bukhara. It was dug in 1620 between khanaka and madrassah. By this time there were more than eighty reservoirs, which supplied the city with water, but Lyabi-Hauz was the biggest. The pool has a length 42 m, a width 36 m, a depth 5 m. The ensemble consists of three monumental buildings: madrassah Kukeldash and two other religious buildings: Hanaka on the west and Madrasah of Nadir Divan-Begi on the east. According to the planning, it was constructed as a caravanserai. There are no rooms for classes – darshona and summer audience – ayvans. Glazed mosaic with image of fantastic birds with prey in its talons is decorated large portal, attached to the building. Water mirror of pool and old trees on the banks of the famous Laybi-Hauz create a unique microclimate which attract residents and tourists. Small restaurants, surrounding the pond are conducive to rest and leisurely conversation. There are marvelous embroidery, products of gold and jewelry. In the evening you can hear the national music and beautiful girls perform folk dances and sing melodious songs. Despite the ensemble Lyabi-Hauz was created during 16th and 17th centuries, it has not changed and is one of the oldest and most magnificent architectural ensembles of Bukhara.